The MSU Museum describes this box as a "Michigan Indian rectangular birch bark box." The creator is unknown and it was acquired in about 1919 by the MSU Museum. 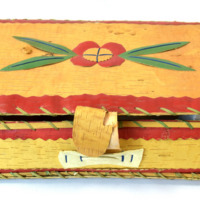 This box has a painted birch bark flower design on top and decorative trim all around the top and sides. Soft leather hinges in the back attach the lid to the box and sweet grass is sewn around the top and bottom. Its dimensions are 11" x 16.5" x 4.5". Because this box is so unusual and little is known about it, we used our imagination and reference to the four "parts" of human life that the Native American Medicine Wheel signifies to describe it.